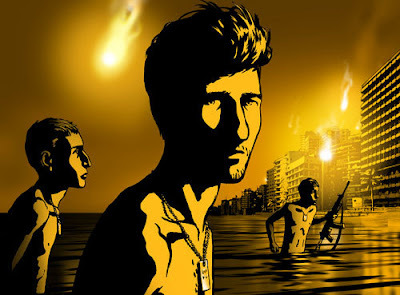 I've put off reporting this for a bit simply because I really can't say too much about Waltz with Bashir yet due to the Sony embargo. But suffice it to say I fell for it in a big way and am glad to see it tied with another Front Row favorite, Man on Wire, for Best Documentary at the International Documentary Awards. Waltz with Bashir opens in limited release on December 25, and Man on Wire will be released on DVD December 9. Matthew, I am not at all surprised that you "fell for this is a big way" as I am anticipating as much. I agree with your strong feelings for PERSEPOLIS too. I will see this sometime around that opening date, and of course I must have an original of MAN ON WIRE. A copy simply will not do.